The Shiva Mandala. My most complex work to date. The Center is hand painted and duplicated from an ancient astrolabe created in 1291 by Muhammad Ali Bakr, the great Persian scientist. Ancient Persian text is inscribed in gold and the Rete is hand cut polycarbonate (translucent). The Shiva slowly rotates @ 1RPM. 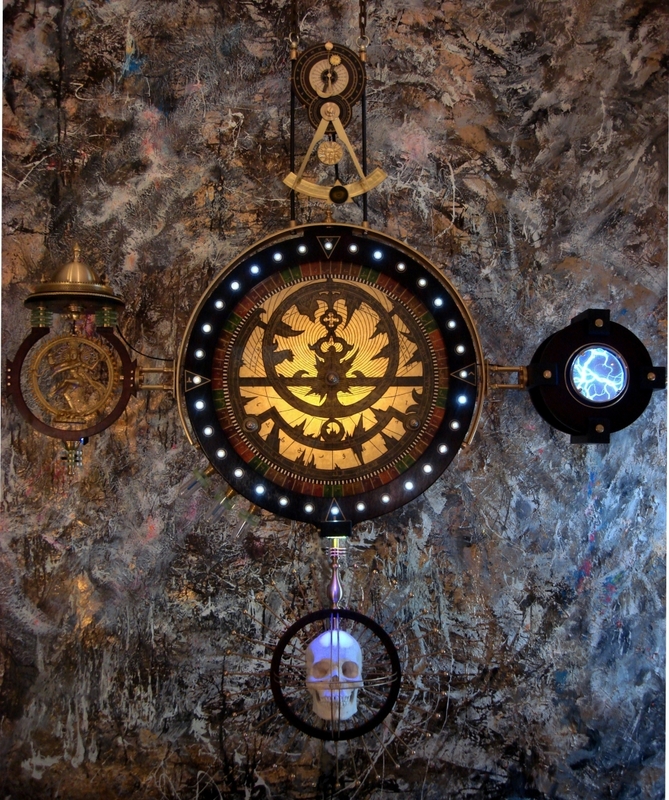 A 24 hour clock with masonic, past master compasses and mariners' quadrant has a swinging pendulum with a holographic, All Seeing Eye. The skull is full-sized and supported in a handmade mahogany gimbal with brass rods. Masonic symbology throughout the design beginning with the Past Master's 'Square and Quadrant' on the top. The Quadrant is the actual swinging pendulum for the 24 hour clock and features a holographic "All Seeing Eye" in the center. Designed and entirely hand made by Art Donovan. Featured at both the historic Oxford Museum Steampunk exhibition, The National Watch and Clock Museum and The Hangaram Design Museum, Seoul, South Korea.